smooshe: Changes in the greenhouse and some baking! Changes in the greenhouse and some baking! Before I jump right into the changes in the greenhouse, lets get this straight... my bedroom is currently my greenhouse. Oh come on, who doesn't have a chandelier in their bedroom? As a girl who doesn't own her own property (yet) but is so dead set on farming, I've got to work with what I've got. So let's take stock of that right now. As soon as the weather warms up enough and the snow disappears (whichever comes first) I'll be out there with a shovel digging up the parent's yard and building myself one heck of a garden. But today I spent my lazy sunday transplanting some of my plugs and baking! The end result of taking apart a couple starter plugs.. here's hoping I didn't make the roots too unhappy!! The spinach is doing really well already! Only 2 seeds didn't want to take off. The dill is looking a little spindly but it was getting too tall for the starter container. I only took apart one basil plug, I'm going to give the other a little more time in the tray. So now you've seen the greenhouse and where my plants are sitting at now... on to the baking! I made two things this lazy Sunday: pie and cookies. The pie(s) were cherry and cherry raspberry, the cookies: peanut butter and peanut butter with peanut butter cups. A little redundancy never hurt anyone, right? 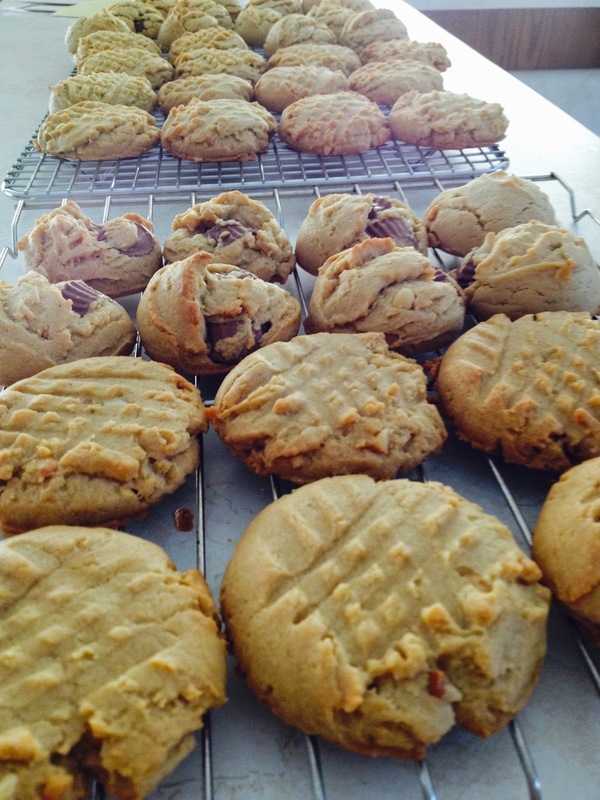 I'd really like to share the recipe for the peanut butter cookies that I made (adapted from chefsavvy.com) because I (and my parents) was really impressed with the way they turned out. They look like little dense nuggets of peanut butter but they're actually really light and soft. Win! Add butter, peanut butter and brown sugar to a bowl (or your stand mixer, I prefer a handheld electric egg beater for cookies, less cleanup!) and beat until well combined (about a minute). Mix in eggs and vanilla (another thirty seconds-ish). Combine baking soda and flour in a separate bowl. With a spatula, hand mix the dry ingredients to the wet until just combined. Fold in the peanut butter cups (at this point I divided the dough into two and reserved half the batch for peanut butter cup free cookies, but you could just mix it all in if you prefer). Either use two spoons, wet hands or (my favourite) a 1½ tablespoon cookie scoop to form cookies. Place cookies on a baking sheet with a silicon mat or parchment paper. Good luck letting these cool completely before eating them, they make the house smell divine. And just for fun I'll finish off with a picture of the pies but I won't share the recipe (yet... pie crust recipe is for another day). Time to bundle up, brave the -30C weather and water some horses!